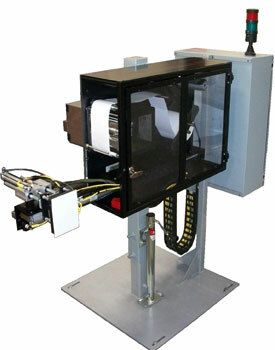 The SA3100 Three Panel Pallet Label Applicator is designed to print and apply labels to the front and/or side and/or back of a pallet load. The machine is controlled by a PLC, which can communicate with the conveyor, stretch wrapper, and palletizer to ensure proper product handling during the labeling sequence. Full diagnostic reports and communication tracking are available, making troubleshooting easy. A SMC rotary actuator and a second slide-cylinder allow the platen pad to rotate 90° in either direction to apply the front and rear labels. Side labels are applied to the pallet load by a variable stroke slide-cylinder tamp assembly. The spring loaded tamp-pad adapts to the pallet load surface. Barcode labels are printed with a Zebra® PAX print engine. The heavy-duty stand, the UL listed NEMA 12 industrial controls enclosure, and the other high quality commercial parts help ensure that the SA3100 will handle the rigors of 24/7 pallet load labeling. The label applicator head has three distinct ranges of motion: linear travel away from the applicator, rotation of the platen pad in either direction, and linear travel of the platen pad towards the front or rear of the load. The spring loaded tamp pad adapts to the load surface.